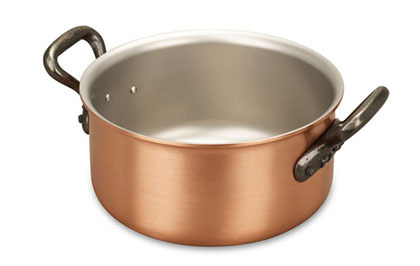 When this 16cm high quality copper casserole isn't nestled in the oven slowly cooking your favourite recipes, or perched atop the hob happily simmering away, it's probably gleaming beautifully on your table, presenting its tender ingredients with pride of place. What a marvelous vessel for individual portions. A great serving piece for side dishes and sauces as well. We do versatility like no other. Falk Culinair. Another of our multi purpose pieces, this little casserole gives you value for money from hob to oven to table. Now that's performance! Lovely little pan that does the usual fantastic job. Top quality and heats up beautifully evenly. Just totally worth the money. 617 customers found this review helpful. Did you? Yes, I did! I am not a good cook. So, rather than use a large pot, I always use a small pot to enjoy the 16cm in the same size of Roudeau and casserole. So there is no waste of food. 700 customers found this review helpful. Did you? Yes, I did!